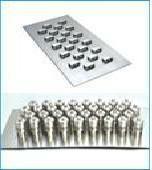 Manufacturer of structured packing, random packing, column internals, column trays, static mixer pusher centrifuge etc. Also offers turn key project services. FINEPAC mesh demisters consist of a pad of knitted metal or plastic wire mesh usually sandwiched between grids for mechanical support. 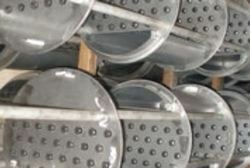 Except for units less than about 600mm diameter, they are normally split into sections of between 300 to 400 mm wide to facilitate installation through a normal vessel manway. The pads are cut slightly oversize to ensure a snug fit and thus eliminate any possible vapour by-pass either between sections or between pad and vessel wall (or shroud). Each mesh pad is formed from crimped layers of fabric knitted from monofilament with the direction of the crimp rotated 90 degrees in each adjacent layer to provide a uniform voidage together with a high ratio of filament surface per unit volume of pad. Standard support grids consist of a framework of 25 mm x 3 mm thick flat bar fixed to a grid consisting of 6mm rods usually spaced on 150 mm centres to retain the mesh with minimum obstruction of the face of the pad. The top and bottom grids are connected by spacer rods passing through the mesh that are welded to each grid to ensure the dimensional stability of the pad. Mesh pads can also be furnished with special heavy duty support grids where these are required to provide a working platform inside the vessel. We are a well known manufacturer of SS Distillation Columns which are available in different sizes and shapes as per the requirement of client. These SS Distillation Columns are available at industrial leading price. 1. Ranging from laboratory columns to large scale process systems. 5. High vacuum process columns. 6. 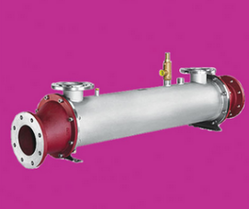 Suitable for both batch & continuous distillation systems. 4. Very low pressure drop,highly recommended for vaccum distillation system. 5. Higher vapor loadcapacity compared to random packing and trays. Static Mixer are a series of geometric mixing elements fixed within a pipe ,which use the energy of the flow stream to create mixing between two or more fluids. 1.The device consists of mixer elements contained in a cylindrical or squared housing and element consist of series of baffles. 3.Device has no moving parts. 4.They are manufactured in wide range of materials, including stainless steel, other Exotic metals and PTFE, FRP. Two Soluble components are mixed together to achieve homogeneity. Gassing of liquids and gas washing is achieved. 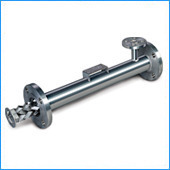 Temperature homogenization is achieved for high viscous and temperature sensitive products. 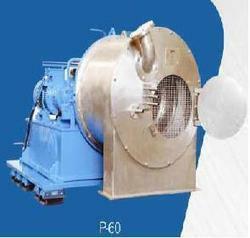 The components to be mixed are pumped at the inlet of the mixing unit containing static mixing elements. Due to the construction of the mixing elements, the fluids are directed radically outwards and inwards while the forward flow continues. This movement is multiplied by introducing more number of mixing elements. The angle of this movement is also changed by subsequent elements. As a result, the mixing effect is achieved with the fluid emerging out at the other end. 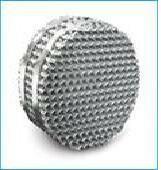 We are a well known manufacturer of heat exchangers which are available in different sizes and shapes as per the requirement of client. 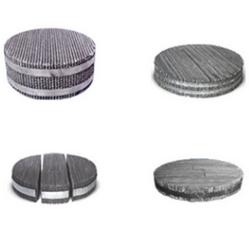 These are extensively used in space heating and power plants, chemical plants, petrochemical plants, petroleum refineries and natural gas processing. 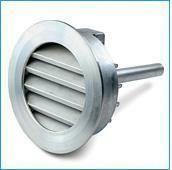 Our Heat Exchangers are available at industrial leading price. 1.Solid liquid separation in continuous operation. 4. Low energy consumption per unit production. 5. Minimum floor space requirements. 6. No spillage, Higher yields. 7. Low maintenance cost with simple maintenance methods. 8. Higher throughput with compact machine. Note: Available in hydraulic and mechanical versions. 1. Higher solid throughput with minimum residual moisture. 2. Cylindrical basket, multistage machines are possible. 3. Easy rotor assembly, simpler dismantling and installation process. 4. Compact structures, easy and low maintenance. 5. Lower pusher pressures, and reduced axial pressure, low energy consumption. 6. Relatively thick cake formation, high wash efficiency can be achieved. Common Salt, Metallic Salts, Nitrates, Chlorates, Carbonates, Phosphates, etc. 1. Bell shaped inverted bubble caps having vertical slots are fixed over cylindrical risers. 2. Vapours travel upwards through risers and diffuse through the bubble caps. 3. Effective diffusion of gas through liquid pool maintained around bubble caps. 4. Wide range of turn down ratios without weeping. 2. Valves are floating due to vapour flow from the underneath. 3. This maintains near constant pressure drop with respect to variation in vapour flow rates. 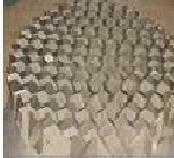 Due to this characteristics valve trays provide higher sustained efficiency. 4. There is no liquid flow under valves. 5. The construction offers improved turn down ratio. 6. Wide legs and locking of valve rotation increases stability and reduces damage to the valves. A mass transfer tower also requires other internal equipments . Liquid Distributor: equally distribution of liquid and vapor within the tower. Collector plates: capture liquid for removal from the tower. Packing support plates: used to physically support and retain packings inside the tower. Finepac manufactures tower internals in a Varity of metals for use in virtually all mass transfer processes. 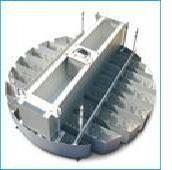 It is in single piece or segmented distributor with integral channel attached. Large hole dimension than conventional discharge systems. The collector is used for small column diameter and which sandwich between body flange. This Bed Limiter is normally recommended for metal and plastic random packings. It is designed to withstand an upward thrust. The opening Size can be varied to suit various packing sizes and the beams can be designed to support a prescribed man-load. The normal bed limiter is clamped on to a support ring. This type of support plate is designed in multi-piece or single piece construction depending upon whether the support plate will be installed through a column body flange or manway. The slot size is based on the size of packing to be supported.